The bound volume of the Fenwick Collection includes seven loose sheets of printed music inserted between pages 74-81, containing fourteen tunes. These sheets are cut or trimmed from the larger pages of a single, so far unidentified, publication; they may have been part of Fenwick’s original loose papers, but the fact that they were not bound into the volume suggests that they were added after the collection was bound, possibly by Richard Welford or a later owner. Several of these tunes have names associated with North or South Shields, or with families and places in those towns. Although further research is needed, these tunes do not seem to appear in any other known collections of dance music, and the writer knows of no other published dance tunes of this period which relate specifically to North and South Shields. The writer thinks it likely that they were written and printed locally and intended for local use. These tunes are not primarily piping tunes, and only six are printed in keys naturally suitable for unkeyed pipes (G maj, D maj, and A maj, depending on the pipes used). Others are, as is fairly typical of collections of social dance tunes of this period, intended for fiddle and other melody instruments playing in the keys of C maj, F maj, B♭ maj, and E♭ maj. The style of music printing is typical of the late 18thC or very early 19thC (for instance, the long S which appears 4 times in the titles as the first letter of a double-s spelling, was out of use in London by about 1800, and in the provinces within the following two decades or so). It is possible to date these tunes with some certainty by reference to three of the titles, “The Nile”, “The South Shields Volunteers Strathspey” and “Major Linshills Favourite Strathspey”. The battle of the Nile (after which Nile Street in North Shields is probably named) took place on 1st & 2nd August 1798, so the tune is likely to have been given that title in the period of public acclamation that followed Rear Admiral Nelson’s victory over the French fleet commanded by Admiral Paul D’Brueys. Both of the other titles refer to the Volunteer Companies raised in c.1798 in reponse to the perceived threat of invasion during the wars with France. More specifically, Major Linshill can be identified as a local gentleman called William Linksill, still remembered in the name of Linskill Street, the Colonel Linskill public house and the former Linskill Secondary School (now the Linskill Centre) in North Shields. Mr Linskill, holding the rank of major, commanded the North Shields & Tynemouth Voluntary Infantry from its inception in 1798, but was promoted to Lt-Colonel in 1802. Assuming that the tune is contemporary with the events, and was not given a retrospective title, this helps date the name of this tune to between 1798 and 1802. This date range is consistent with the intermittent use of the long S and the style of printing generally. 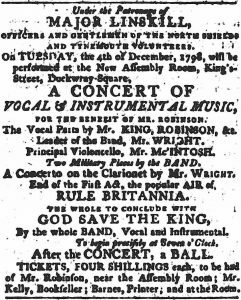 In December 1798, a concert and ball was held under the patronage of Major Linskill and his officers, and advertised in the Newcastle Courant of 1st December 1798. 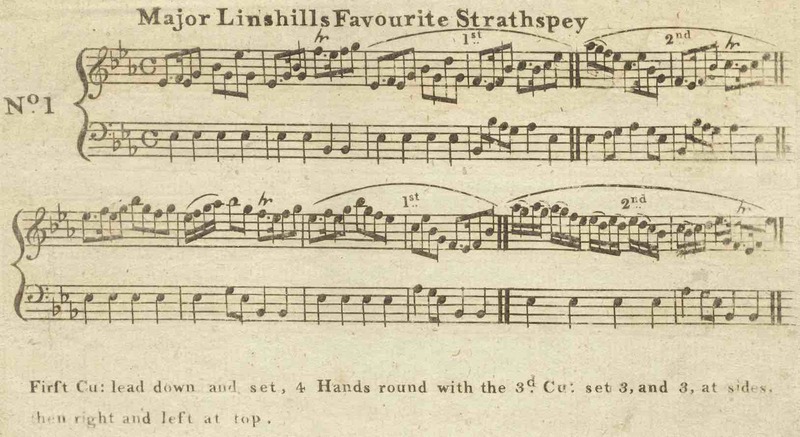 It is tempting to speculate that Major Linshills Favourite Strathspey and the other tunes may have been played for dancing at that and other similar balls, and included “The Nile” in recognition of the patriotic fervour that followed Nelson’s triumph. 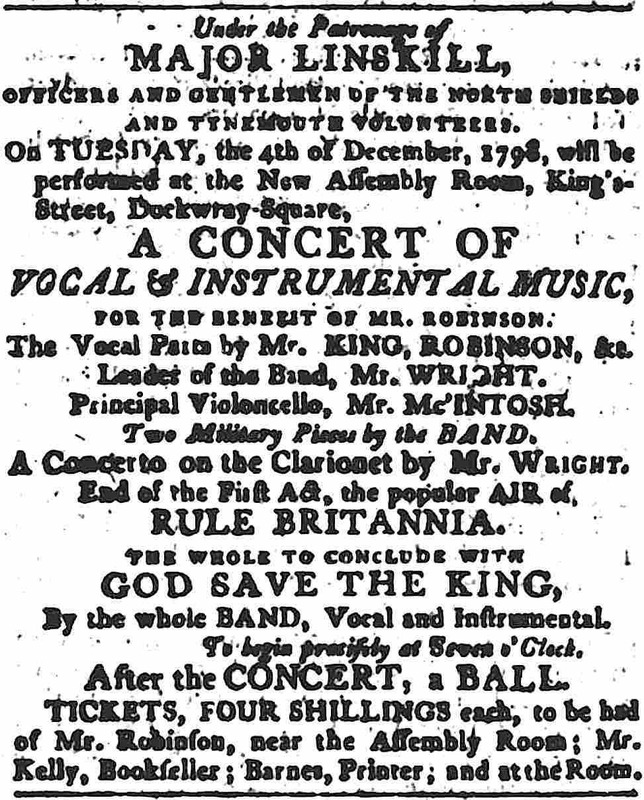 Two of the musicians named in the advertisement can be identified as the same musicians who are advertised as playing in various combinations for similar concerts on behalf of the Newcastle Volunteer Corps several times between 1797 and 1800. That their names are printed in upper-case letters suggests that the people likely to attend the concert and ball would be expected to recognise the names and be attracted to the quality of the music. Mr Wright was either Thomas or, more probably, his son William. Thomas was a Newcastle musician and composer, and William, also a musician, had a music shop in Newcastle and was the publisher of John Peacock’s tune book. Mr Mc’Intosh was Abraham Mackintosh, son of the famous Scottish fiddler Robert Mackintosh. Abraham migrated to Newcastle where he worked as a musician and dancing master. 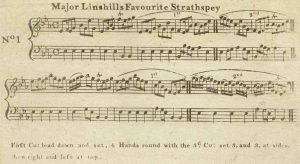 In 1801 he published “A Collection of Strathspeys, Reels, Jigs &c.” One of his tunes, “Miss Aubone Surtees’ Favourite”, is also known as “Blaydon Flats” under which name it later became associated with the Gateshead fiddler James Hill; it is still in the local repertoire of traditional dance music. These identifications are important in illustrating the existence of a network of musicians working in the area and playing for social dancing. This group of musicians also included John Peacock and Alexander Kinloch, a Newcastle dancing master for whom Thomas Bewick printed ball tickets with an illustration showed a Northumbrian piper playing for dancers.